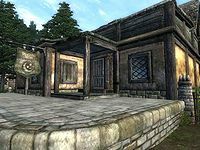 Five Claws Lodge is an inn located in the Chapel District of Leyawiin. It is found adjacent the West Gate to the city, across the street from the Chapel of Zenithar and next to The Dividing Line. The publican, Witseidutsei, buys potions and food while only selling the latter. The ground floor contains the reception area which consists of a well-stocked bar with a large counter and a rich dining room. The rooms can be found just to the left of the entrance. The room you can rent is 'number 2'; it is spacious and well-lit and contains two chests of drawers, a table and a double bed. The other room, 'number 1', is locked, and contains a double bed which is free to sleep in. The Thieves Guild Fence Dar-Jee can be found eating and conducting his business here every evening. Fighters Guild members Rellian, Vantus Prelius and Dubok gro-Shagk can be found here during the Drunk and Disorderly quest. Witseidutsei is very keen on keeping her inn clean and in good order (one of the reasons she's ticked off during Drunk and Disorderly) and brags with you, saying the bed is free if it is not clean. Esta página foi modificada pela última vez à(s) 02h53min de 27 de janeiro de 2013.